Kids, Cows and Grass: March Madness - small town style! March Madness - small town style! My "Bleach Boys" surprised Gma Jan at the recent Lyons Ranch bull sale! I've been a bit distracted this week! Yes, the cattle are still getting fed, the bulls had their doctor's appointment, and calves are being born and tagged, but our family has been fired up about BASKETBALL! More clearly, small town basketball! We have our own version of March Madness! My boys are juniors at the little school in our town and they play basketball. Now, remember we are one of the smallest schools in Kansas. We will graduate about 20 kids this year and we need everyone who can dribble a basketball to go out for the team. In small towns, no one gets cut from the team! We beg the foreign exchange students to play sports. This year our high school girls team started out with 8 girls playing--and we lost one player near the end of the season. So the 7 girls left played their hearts out with very little rest time during games and ended the season as the Sub-State Runners-Up! We were very proud of them. But for the first time in 12 years and only the second time in the history of our little town, the boys team won Sub-State and qualified to play in the State 1A, Division 2 Boys Basketball Tournament at Hays, Ks. The only other team to play at state began a crazy tradition that the current team embraced--bleaching their hair! Every one of the players, managers, and stats keepers bleached their hair WHITE! 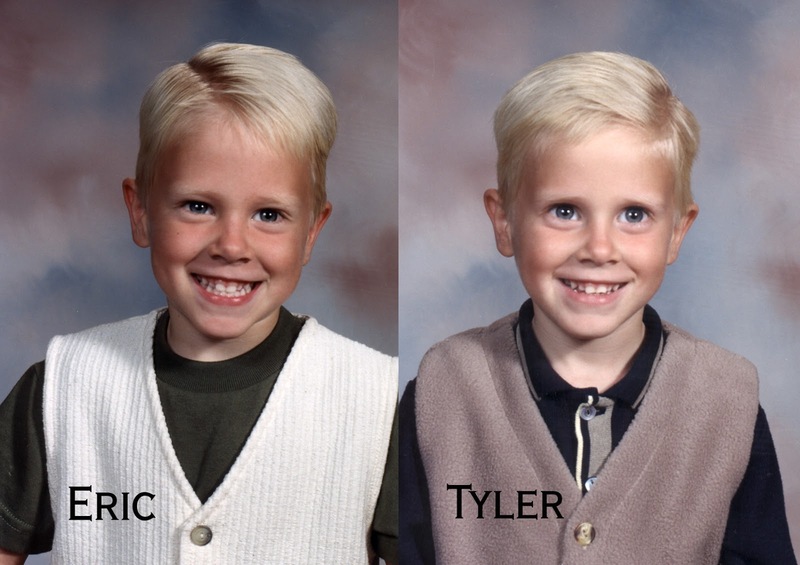 My boys were once very blonde, but this is crazy white! We hadn't even gotten home from the Sub-state championship game when the team all had an appointment at the local beauty shop (the owner had a son on the team in 2001, incidentally!) for the next day to bleach their hair. I instantly freaked out as my family's bull sale at Lyons Ranch was 2 days away and the boys would appear at the sale in surfer-style!! But then I realized that team unity is important and it would actually be fun to have everyone ask "what did you do to your hair!?" and be able to tell them the story about going to state! Now, I've been asked if the team is just cocky, or arrogant, or if they are making a statement to the officials or something. NOTHING like that! It is merely about team unity and tradition. They are honoring the original team by following their tradition, as well as churning up excitement for the games. This team is a group of small town kids who are proud of their accomplishments and are excited about doing something that very few of the teams from our little town were able to do. There are a large number of former Huskie teams who deserved a chance at a state tournament and a number of kids who are truly envious of this team. That is totally understandable. I think their coach said it best at the community pep rally the other night. I'll paraphrase since I didn't write it down. He said, talent will win you a few games, but it is chemistry that will help you go all the way. And we have CHEMISTRY! You know, everything has to "click" to have a state-bound team. Talent, chemistry, luck and even atmosphere and fan support--but most importantly, the boys must be focused on the game. I'm sure our boys will do well, and I am proud of them for being in the top 8 teams in the state for their small school division. I'm even more proud of them for their sportsmanship and team-attitude. Go Huskies, and don't worry...the cattle will still be fed and chores done. But we have a lot of jobs waiting for you Blythe Boys when the tournament is over. Focus now, and enjoy it. Once in a lifetime memories--that is what it is all about! UPDATE: The Huskies ended up 3rd place in State and very proud to have been competing at that level! The teams at the State Tournament were all awesome and only 8 teams get to qualify for State. What an honor and privilege to be one of those 8 teams. I'm proud of our boys and their teamwork, sportsmanship and heart...as well as their talent. It was such a thrill to see our boys on the court in the Kansas High School State Basketball Tournament, for 1A, Division 2 schools. Great job, Boys!! Thanks, Debby! It is cool for our little town! My boys are having fun with it and we play the first round tonight. Hope they can make it through tonight! I like your header also I went to a small school the had 300 from 1 thru 12 grades Your children can get a lot from a small school Trying to talk son into rigging a calf carrier from the Polaris. Maybe the cows would follow better. You know just the type of town we live near! And, yes the cows do really follow much easier with our calf carrier. I've also heard of people putting a calf on a sled behind the 4-wheeler. But there is no snow, so it would tear up a sled...and sometimes the calf is energetic and would jump off! So the carrier is perfect. Kathleen! Yes, Mom is actually really having a great time with the Bleach Boys. I was on the lookout for a wig for her...but can't find it when I want to. The boys might have taken it for someone else. But it would have been fun for Gma Jan to show up with a bleach blonde afro!! Good Luck tonight. I come from a small town community of about 350 and we went to State with our girls team when I was a sophomore. First Goessel, Ks team to go to State ever in basketball. We were super excited. Lots of kids are excellent players but you are right it is about the chemistry of the team and their willingness to work together to promote the entire team. Been following you this week and hoping to hear that they become State Champs. Kathy, thanks for your support. You know exactly how our little town feels--the energy and excitement for our kids! LOVE IT!